Salem's second game of the season was also postponed due to rain. They will make it up as part of a doubleheader today beginning at 5:05 pm. Triston Casas went 1 for 3 with a double and a walk as he scored the winning run in the bottom of the ninth inning on an RBI groundout from Grant Williams. Tyler Esplin added a pair of hits and a double as well. Thad Ward turned in a solid start, allowing just two runs in five innings while striking out six. The Drive bullpen was tremendous, headlined by Rio Gomez, who struck out four in 2 2/3 scoreless frames. Dustin Pedroia played for the second straight night as part of his rehab, this time for five innings. He went 1 for 2 with a single. Player of the Night: Denyi Reyes finished off 2018 with 12 wins, an ERA south of two, and a WHIP under one. He picked up right where he left off, allowing just two hits in six innings of work. 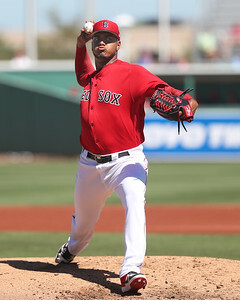 Reyes was an international free agent signing in 2014 and is ranked 19th at SoxProspects.com.